Historic antique house with private swimming pool. The house is a part of a beautiful antique ex-bishops palace in a small borgo (Mazzola) near Fivizzano, a beautiful Tuscan town in Lunigiana in northern Tuscany. The house has been perfectly restored with original materials. You reach the residence via a cortile (courtyard). Beautiful monumental stairway in arenarea (natural stone from the region). Spectacular view of the Apuan Alps. The garden is located on 2 levels with a private swimming pool on the highest level and a second terrace on a lower level, everything with a great deal of privacy. The Lunigiana district is the most northerly area of Tuscany surrounded by Emilia and Liguria. The area is dominated by the Valle di Magra, the Appenines and the Apuan Alps. It is a mountainous region with beautiful views. There are numerous towns, little villages ("borghi"), castles from Roman and Medieval ages. It is a land of chestnuts, mushrooms, wild boar and its own cuisine. Through the isolated location, the area has remained original ; there is no industry, the rivers and streams have clean water for swimming and fishing. The area is ideal for lovers of outdoor sports, walking (via old crusaders routes), cycling, mountain biking, skiing (Zeri and Cerreto), golf, horseback riding, etcetera. 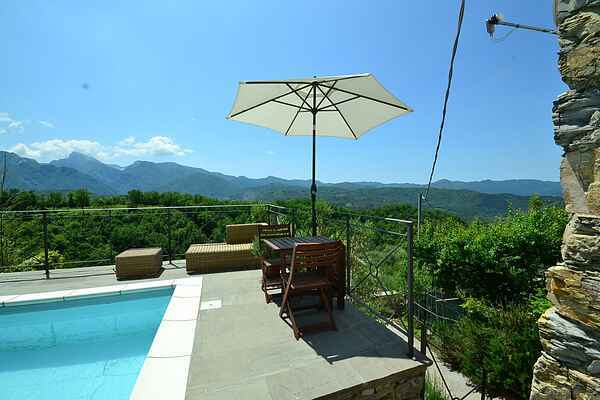 Lunigiana is in a wonderful location with regard to the Tuscan and Ligurian coast; 30 minutes to the Gulf of La Spezia, Cinque Terre, Versilia, but also Lucca, Parma, Bologna, Pisa, Florence, Livorno, Genoa and Milan are available within 1-2 hours.